For years, I’ve ridden the Tour de Cure, the fund-raising bicycle ride to benefit the American Diabetes Association. I’ve ridden for a coworker’s son, my supervisor, my mentor, my wife’s friend, and others. But this year, I learned my own brother has been diagnosed with pre-diabetes. Now this fight got personal. Maybe you know someone affected by diabetes. Maybe it’s your family member. Maybe it’s yourself. I’m riding again to raise awareness. To fight. To Stop Diabetes. Join my team and ride. Sponsor a rider. Or share our links to raise awareness among your own circle of friends. Health and wellness. Bicycling. Fresh California air. Gorgeous spring weather. The Northern California foothills. Put them together for an event: the Tour de Cure, cycling to raise awareness for the American Diabetes Association. 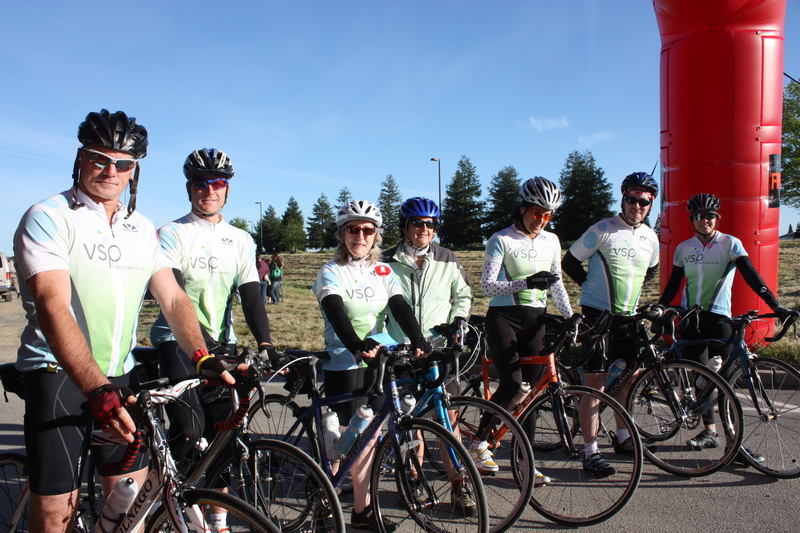 The ADA schedules Tour de Cure rides all across the US, and this May, I ride with my “Blood, Sweat, and Gears” teammates. This year, we set a goal of 20 riders, $5,000. With the ride just around the corner on May 4, we thank you in advance for helping us reach that goal. Please follow our team’s progress, join our team, or sponsor a rider. VSP goes blue for diabetes! “World Diabetes Day is a global awareness campaign that’s celebrated every year on November 14. Iconic landmarks and buildings across the world are lit in blue to create a united voice for diabetes awareness! Across America, cyclists are riding in 40 regional Tour de Cure events. The Tour de Cure is a series of fund-raising cycling events held in 40 states nationwide to benefit the American Diabetes Association. Incredible finishes at the Tour de France often stimulate new bicycle sales. Olympic medal performances often inspire youth movements into local recreational swimming, gymnastics, and sports programs. GeeWhiz here. I’ve seen the statistics. I’ve heard the stories. I know the terminology. Geewhiz, my day job even includes working with content that connects an annual eye exam to early detection of diabetic retinopathy. But in the spring of 2008, two of my coworkers within mere feet of my cubicle learned that they were directly affected by diabetes. And suddenly, statistics became flesh and blood to me. That’s why I’m walking on October 11 to fight diabetes. So, if you’re already on a team walking to fight diabetes, I’ll be right there alongside you. If you’re not walking on a team, visit my site and sponsor me. The ABCs of good communication just got an "F"